Showing 11 articles from March 6, 2013. Most people in Winlock know the old Fire Hall downtown is the home of the Winlock Historical Museum. Although it may not look like a hive of activity, there’s been a lot going on over the last couple of years. We have been working hard on various projects and one of our ongoing concerns has been how best to store and archive the old photos we have. In the wake of Toledo’s fire in 2011, which destroyed irreplaceable photos, it was determined we get a scanner so we can copy photos and store them digitally in different locations. Last year that goal was achieved and we’ve managed to scan nearly all of our photos. 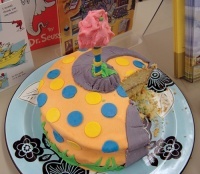 Guests and staff at the Winlock Timberland Library celebrated the birthday of Dr. Seuss Saturday, the first event to kick off the Family Read-Aloud program. Organized by Library Associate Becky Standal, the event was one of several to celebrate the life and works of the beloved children’s author, who was born March 2, 1904. We didn’t make it to the last Acoustic Saturday Night on the 23rd, but I saw the sign-up sheet left on the piano and it was full from top to bottom. We were sorry to miss the re-debut of our saxophonist with the lung transplant. The next one will be this coming Saturday night at 7 p.m. in the Café. Going back to Wednesday this week, there will be an Open House for Newcomers @ 1 p.m. in the Café. Refreshments will be served and it will be an opportunity to “meet & greet” new (and not-so-new) neighbors. Stories that were very long would be told in two or more consecutive nights. In times gone by, it was the custom to make a halt, perhaps when those who were listening to the story were disappearing or dropping off to sleep, saying something as, “a’unac wentkackta wat’I’t’ac,” “Now I will tie up the myth,” implying that the myth was like a canoe, and had to be moored to a tree or log along the river until the next night’s myth journey. When the story telling was in order the next evening, the story teller might say, “a’unac’tca’qwtlkta wat’I’t’ac,” “Now I will untie the myth,” and the narrative would proceed from where it had halted. Should the storyteller wander from the main stream of the narrative or diverge into a side channel of gossip or other irrelevance, one of the listeners might admonish by calling out, “ya’wentamac wat’I’t’ac,” “Your myth might float away.” In the old days each phrase of the narrative was concluded with an affirmative semi-ritual call of “I.’, I” literally meaning “Yes!” from the listeners, who if awake were expected to respond regularly in this manner. Many thanks to our March column sponsor. Local, reliable, competitive. They even vacuum! Toledo High School presents An Evening of Excellence 7 p.m. Tuesday, Mr. T Pageant at 7:30 p.m. Wednesday. Says Mr. Huffman: “This is quite an event!! !” Call (360) 864-2391. This month’s “Notable Folk” is Carol Kearns. Retired after 31 years of teaching elementary school in Shoreline, Winlock, and Onalaska school districts, Carol is currently teaching parenting classes in Mossyrock. She’s taught similar classes through the Centralia College in Winlock, Onalaska, Centralia, and Toledo. “I think that the parents who are taking it find it very beneficial,” she admits, quite content with the progress she’s making. She is also the Choir Director and has an Administrative Council chair at the Winlock United Methodist Church, which she has been involved in for over 30 years. And, last but not least, Carol is also serving her second term as President of the Sigma Chapter of Delta Kappa Gamma, which honors women educators. Between all her various positions, Carol is plenty busy doing a lot for the community. Thanks for everything, Carol. SOUTH BEND – The Pacific County Emergency Management Agency is coordinating with the Washington Emergency Management Division to host a NOAA Weather Radio Program on Thursday, March 21 from 6-8 p.m. at the Grays Harbor College Riverview Education Center (600 Washington Ave.) in Raymond. The program is designed to educate the public on the warnings and alerts that may be issued from the National Weather Service. 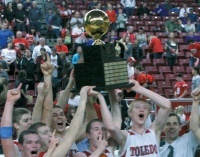 The Toledo High School boys basketball team has returned home with a first-ever state championship trophy after dominating King’s Academy, of Seattle, 38-27 Saturday at the WIAA State Tournament in Yakima. The Indians placed second in the A1-level tournament in 2007, falling to Brewster in the final round, and were fourth last year when they were defeated by Zillah in the first round. One sentence and three warrants were issued by Interim Judge Jim Buzzard during municipal court in Winlock Thursday.